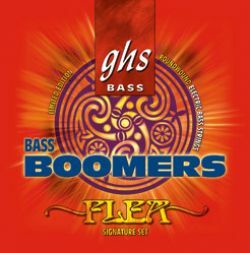 Flea uses the tried and tru formula of the GHS Bass Boomers that the world has counted on for decades. GHS Bass Boomers are a Nickel Plated Steel wrap wire with a special combination of Stainless Steel and Nickel Plate on the low E string. The unique Boomer hex core gives this string added strength. The Red Hot Chili Peppers count on Flea to provide that hard driving bottom end and these strings are a crucial part of that signature sound.